Andrew Goldsmith was born in 1985 and grew up in Redondo Beach, CA, with his parents and three younger siblings. He was a good student, enjoyed surfing and skating, and had many friends. During high school, however, his grades began to slip due to excess partying. A sense of aimlessness followed him to community college, where he was plagued by insomnia and couldn’t escape the feeling of being lost. Out of the blue, Andrew was hit with the idea to join the military and go to war. He was 19 years old. From 2004 to 2009, Andrew Goldsmith served as an Infantryman in the United States Armed Forces. As a Private, he was trained to be a machine gunner for an Infantry fire team for nearly a year before deploying to Iraq in December 2005. By the time he left the army, he was a Sergeant, had been given command of his own fire team, passed the infamously brutal Army Ranger School, and toured Iraq for a second time. 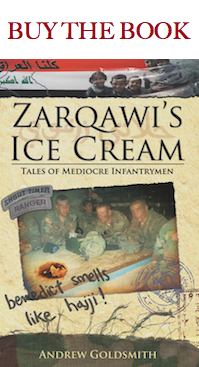 Zarqawi’s Ice Cream: Tales of Mediocre Infantrymen is Andrew Goldsmith’s honest recollection of his experience as a soldier. The book was written neither to glamorize nor degrade the army, but simply to expose the core of humanity amidst the call of duty. Join Andrew as he tours the United States promoting Zarqawi’s Ice Cream on military bases and in book stores throughout the country. This website will be updated regularly with photos, videos, stories, and information about the book tour. We hope you enjoy Andrew Goldsmith’s Iraq war stories and welcome all of your questions and comments. Go Andy! Your friends in Redondo won’t forget you! I saw a guy in our store (SOG Armory) wearing a shirt that said Zarqawi’s ice cream on it. I thought what the hell is this? I checked out your web site and will be checking out the book. I was over there in the box when all that was going on as an evil contractor. Anyway, I will check out the book. Good luck with the book and how do we get the t shirt. Unfortunately I did not get to help the guy with the shirt and ask.